A lovely light-filled house situated with Lake and Mountain views from the balcony. Located within walking distance from downtown Taupo where you’ll be over-whelmed by the cafes, restaurants, shopping and other attractions on offer. 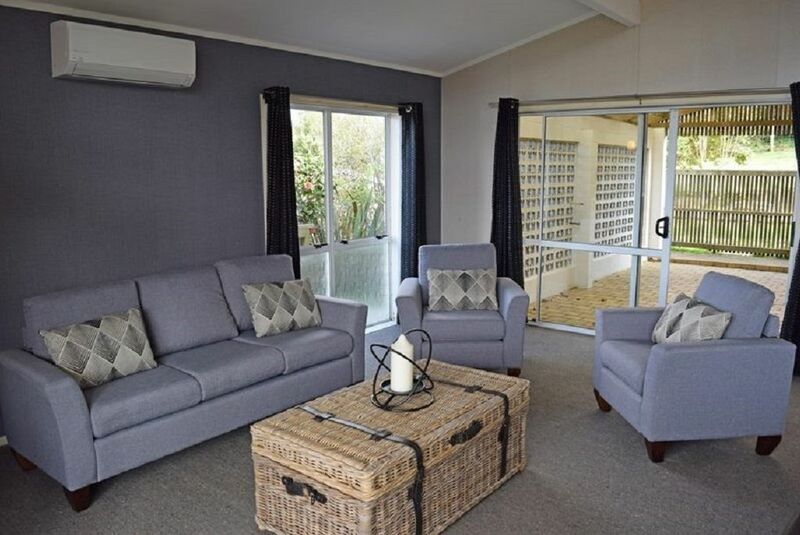 While handy, this holiday location is however still situated to avoid the hustle and noise when Taupo is at it’s busiest. The house itself has 3 bedrooms - 2 of which are double rooms and the 3rd downstairs is a very large self-contained space to accommodate more guests than your standard bedroom, featuring its own bathroom, living area, TV and kitchenette. The upstairs area boasts a comfortable lounge and dining area with Television and sound system (devices can be connected via a aux cable or bluetooth port) with a large balcony and separate covered patio area so you can enjoy outdoor dining, whatever the weather. The main living area also has a full kitchen with a large fridge/freezer, freestanding oven, dish washer, microwave and all the equipment you need to cook, dine and entertain. Full laundry facilities available (Washing Machine, Dryer and Ironing). The entire house has access to free Wifi. This home is less than 15 minutes walk to the venue of the Taupo Summer Concert! No hidden costs - bedding, towels and exit clean are included in the nightly rate. There is a lockable garden shed available for bikes and other sports equipment to be stored safely. There is also a large back section for family to enjoy, including a trampoline. Ample off-street parking is available for 4 x vehicles and/or boats/trailers. Please note, this house is currently having some work done to it. The furnishings will differ from those in the photos, however, the house will be furnished to a high standard. If you have any young children, you may wish to bring a stair gate. Smoking is not permitted anywhere on this property. Nor are pets.